A small, suburban community near the Jersey Shore along the Atlantic Coast primarily relies on a single water treatment plant, the Suez Matchaponix Water Treatment Facility. The plant has the capacity to treat more than 5 million gal of water per day relying on surrounding wells and the Matchaponix Brook. The small community of Manalapan, N.J., has a strong historical past beginning with the American Revolutionary War. However, it has gradually transitioned from an agricultural community to a more suburban one, surrounded by larger cities due to continued growth and development. In a continuation of its investment in water infrastructure, Suez Energy undertook a water settlement basin rehabilitation project in spring 2018 at the Matchaponix treatment facility. VersaFlex Inc. and its certified applicator, Island Pavement Cutting Co., discussed several potential solutions to help rehabilitate the basin. 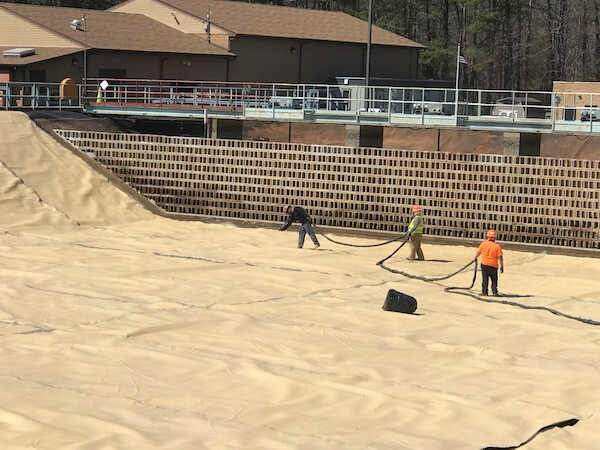 Suez needed a quick return to service for the facility’s basin, in time for increased summer water demands, and needed to stay within a strict budget. Quick return-to-service times help limit inconveniences to the facility and potentially to customers, while completing a project within a strict budget showcases the most cost-effective solution. Based on these requirements, all parties agreed upon a composite panel lining system that offered better toughness, strength and performance in the long term. The approved system included VersaFlex FlexTain 80 pre-sprayed polyurea panels bonded together with AquaVers 405 polyurea over the existing basin high-density polyethylene liner. This would create a competitively priced monolithic lining system for the entirety of the basin. Rehabilitation projects such as the Manalapan experience provide owners and operators opportunities to implement new systems that provide protection and enhanced structural integrity that will contribute to their facilities for years to come. To contact Raven Lining systems go to versaflex.com or call 913.321.9000.